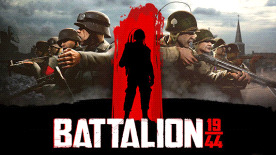 Whether you want to host a mod, run a private competitive match; or ramp the player count well above the recommended settings; Battalion 1944 allows you to host your own dedicated servers. This heart-thumping multiplayer experience is being crafted by designers who have grown up playing competitive top competitive First Person Shooters; alongside community feedback from professional FPS players and an Early Access community shaped by the same gaming experience. Owners of The Turing Test will automatically unlock a weapon skin in Battalion 1944 inspired by The Turing Test's iconic Energy Manipulation Tool.